Disclaimer: This post is brought to you by Zephyrhills® Brand 100% Natural Spring Water. Back in April I started working at a gym and found myself prepping snacks the evening before my early morning shifts. If I want to make it through the day without feeling famished, I need to include snacks in my lunch bag to dig into in the morning before lunchtime since breakfast often occurs at 5 a.m.! I also frequently need something to snack on after lunch and after I teach my afternoon water fitness class. I’m also trying to get better and better about drinking lots of water throughout the day. Now that I’m teaching a water fitness class in the middle of the day in the stifling Florida heat, I’m sweating more than ever and need to stay hydrated. I try to make sure to drink a big glass of water before every meal and snack and carry a water bottle with me everywhere. I love adding sliced cucumber, lemons and limes or strawberries to water for a little flavor. When it comes to snack time, I try to include protein in my snacks to help keep me full and do my best to incorporate fresh fruits and vegetables whenever possible. I also like the grab-n-go convenience of trail mixes and granola, so I try to enjoy healthier versions of these snacks. And you know I love my peanut butter! This snack is creamy, crunchy and protein-packed. Another benefit? According to a Harvard review, nuts such as walnuts may help lower cholesterol and cardiovascular risk. 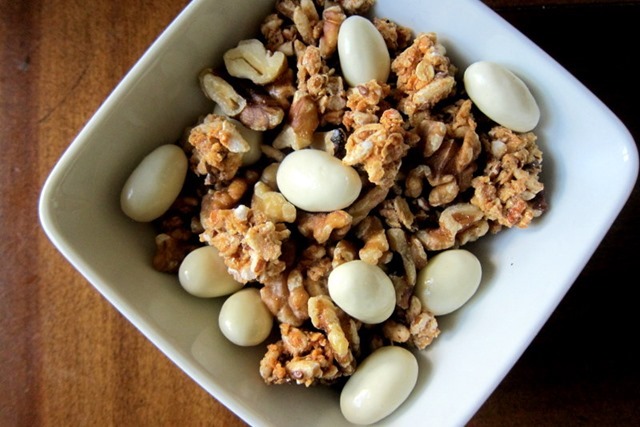 When I’m in the mood for something slightly sweeter, I opt for a homemade trail mix made with high fiber, whole grain cereal, nuts and yogurt-covered almonds. 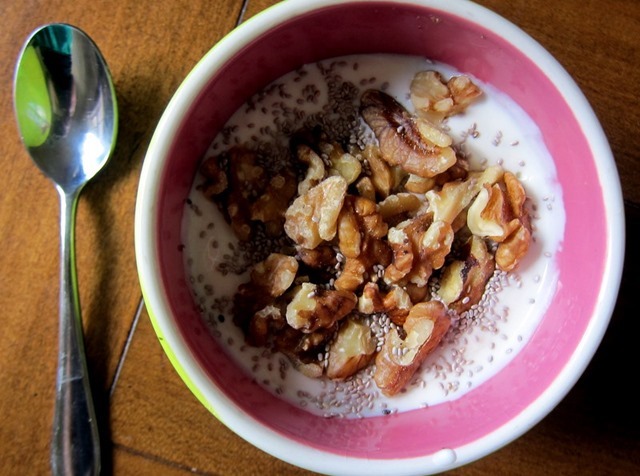 A few of the yogurt almonds add a kick of sweetness that satisfies my sweet tooth while also providing my body with healthy fats and a bit of protein. I made these last week and they were perfectly portable and poppable. In less than 30 seconds, I can pop into the break room, grab two of these oatmeal walnut date balls and head out to meet with my next client. A super-fast snack! 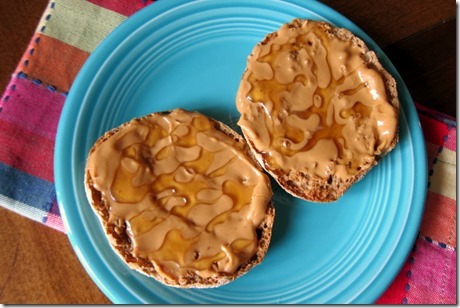 This lighter snack is one of my favorites to eat right before I have to teach my group exercise class. It doesn’t sit heavy in my stomach and is an easy way to incorporate vegetables into my diet. Fresh peppers and cucumbers are my favorite because they’re extra hydrating. According to SHAPE magazine, bell peppers are 92 percent water! 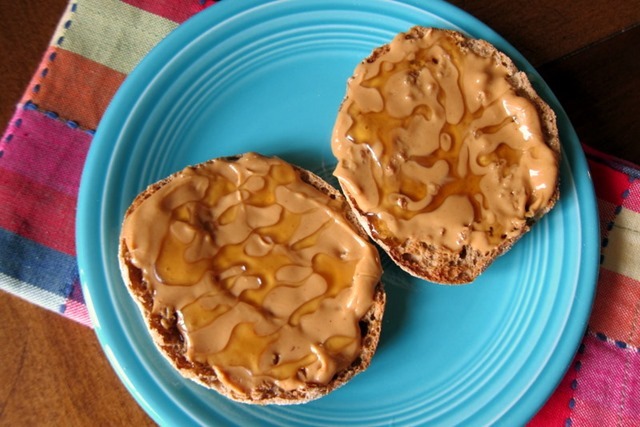 As a big-time peanut butter lover, you know I’m all about this snack. Healthy fats and whole grains. Nice and filling! I cannot get enough of this stuff! 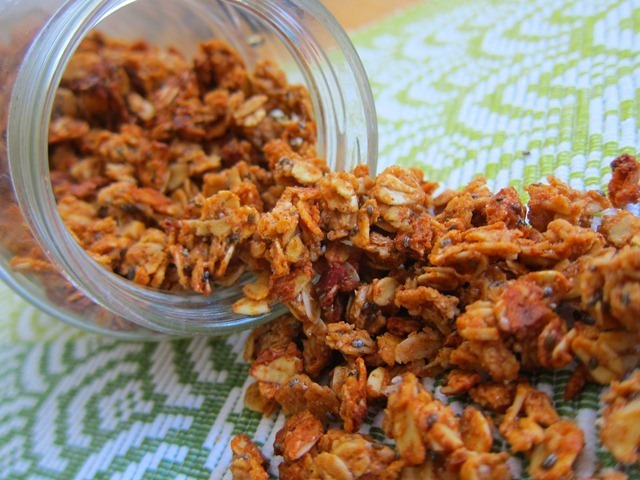 I love sprinkling it on top of Greek yogurt or cottage cheese and make a big batch of the granola couple of times a month to have on hand for easy snacking. The ingredient list is short and includes stuff I almost always have on hand in the pantry. Another hydrating snack, and one of my favorites to eat right after I’m done teaching water fitness! 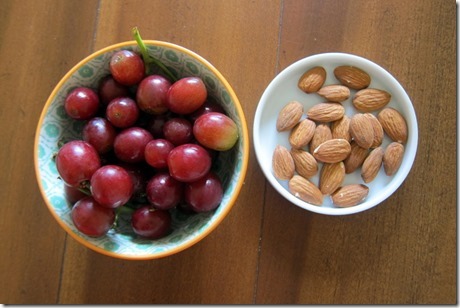 There’s something so refreshing about cold grapes and I make sure to eat them with a handful of nuts for some staying power. I know many people are creeped out by cottage cheese, but I love the stuff. Adding a dash of cinnamon really kicks up the flavor! I’ll also often add some chopped nuts to this snack for some healthy fats. Does anyone else always seem to forget about hard boiled eggs as a great protein-packed snack food? They fell off my radar for a while, but they recently made a come back and I am loving them! What healthy snack have you been loving lately? This post is brought to you by Zephyrhills® Brand 100% Natural Spring Water. So many great snacks there! 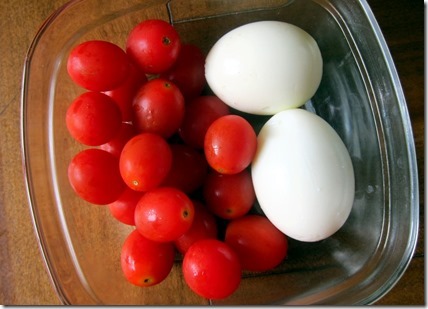 I never ever think of having a hard boiled egg as a snack but I really should give it a go. 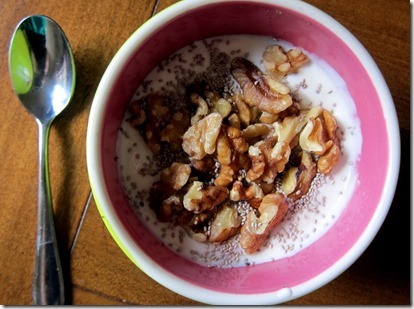 I love greek yoghurt mix ups where you add your own fruit, nuts and seeds. 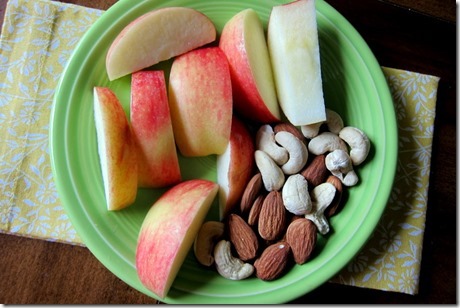 Delicious snack ideas! 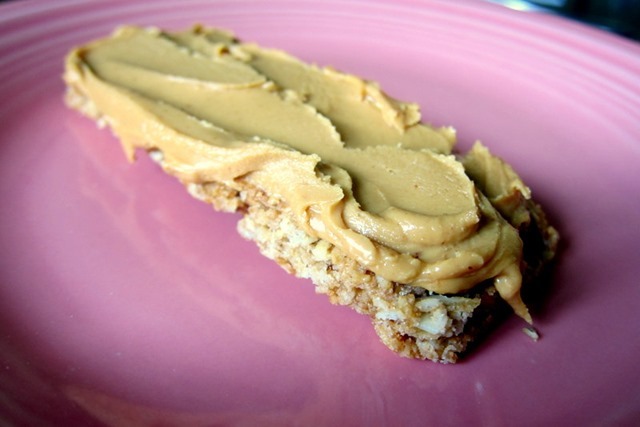 I see a lot of my favorites up there, I love spreading peanut butter on top of a granola or energy bar too! OOOH those date balls look delicious! I think I need to try those. My current snack of choice is popcorn– I pop a batch on the stove (so much better than microwave!) then put it in baggies to take to work. I always get hungry around 3ish and this is the perfect thing to eat! Combine 1/4 cup margarine + 1/4 c. milk with 3/4 cups sugar and boil hard on stove top. Meanwhile measure out 1 1/2 c. old fashioned oats, and add 1 1/2 T. cocoa powder and 1/4 cup peanut butter to the oats. Pour in the liquid and stir in 1/2 tsp. vanilla extract. Stir and immediately scoop into cookie shape and place on a plate. Put in freezer for about an hour to firm up. I then put the cookies into a container and keep them in the freezer. I’m constantly trying to brainstorm healthy, vegetarian-friendly snacks for work. 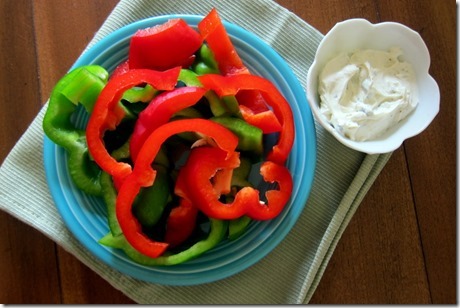 The veggies + tzatziki is a great idea! Hummus is great but it gets tired after a while. Love this! Got another office food tip for ya. This isn’t a snack, but one thing I started doing was keeping a thing of salt, crushed red pepper and olive oil at my desk. Sometimes my leftovers aren’t as great as they were fresh, so I’m able to breathe some life into them with one of these condiments. Love all your ideas! 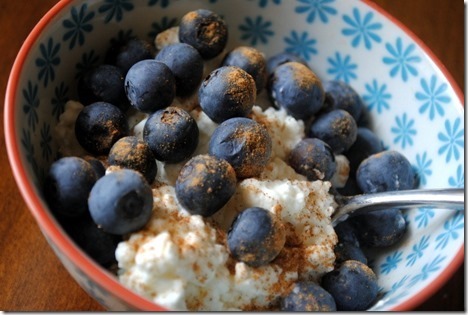 I love cottage cheese too, although, I must admit, it is not the most visually appealing! I love trail mix or a Luna bar – love the chocolate covered coconut flavor – with a big glass of water! Yum! All of those snacks look so tasty! 🙂 I also love and tend to forget about hard boiled eggs 🙂 I think I am going to have to try you date balls. I have a couple of “ball” recipes of my own…but none as simple as yours!! I love creating new and interesting snacks to mix it up. Some of my favorites are coconut cream pie larabars with berries, or apple slices with almond butter, cinnamon and honey. These snacks feel indulgent but are also nutrient-packed! What kind of cereal do you use in your homemade trail mix? I want to make some tonight! Favorite snacks are trail mix. Celery with pb and raisins. Pieces of fruit. Meat and cheese. Yoghurt is another top one too. I want to try the date balls! I love cottage cheese too. 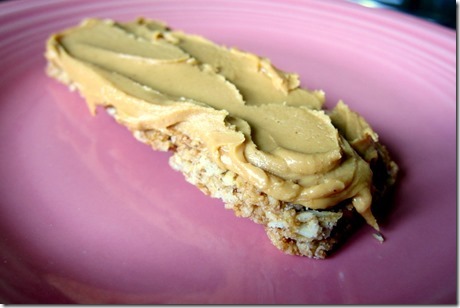 I put it on top of Wasa crispbread, and top it off with some Season-All or Mrs. Dash and cucumber or tomato slices. YUM! I was wondering what kind of whole grain cereal you like best? Tremendous issues here. I’m very happy to peer your post. Thanks so much and I am having a look forward to touch you. Will you please drop me a mail? I had figs today with a chunk of cheese this morning, delish! These all look so yummy and healthy. 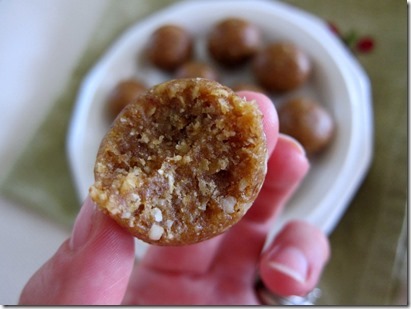 I love the oatmeal walnut date balls! I make something similar but without the oatmeal because I’m trying to go gluten free (and sometimes other dried fruits or whatever I feel like adding). When I don’t have time to make up a batch I buy Wai Lana fruit and nut bars. They are essentially the same thing, dried fruit and nuts, and SO good! Date balls, in any variation = so good! But to call them healthy is a bit of a stretch, they are basically just sugar! Treat them as a treat…or perhaps to offset the insulin spike, add some protein powder to the mix, or snack on a bite of jerky along with. 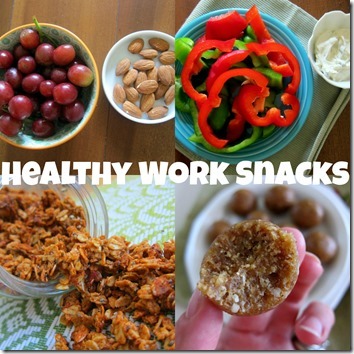 These all healthy snacks recipes & ideas are really good and keep everyone fit..